Cavalor NorPlus Shampoo is a gentle, refreshing shampoo for horses with neutral pH. It is ideal for the removal of stubborn stains and for added shine in white horses. 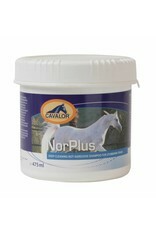 Cavalor NorPlus protects the oily top layer of the skin and is suitable for all skin types. Mix 30ml Norplus with 8L water and mix well until fully diluted. Use a sponge to lather shampoo onto your horse and rinse with water afterwards. Please note: For exterior use only.